Production: Twentieth Century-Fox; black and white, 35mm; running time: 100 minutes. Released 1939. Filmed in Fox studios. Producers: Darryl F. Zanuck with Kenneth MacGowan; screenplay: Lamar Trotti; photography: Arthur Miller; editor: Walter Thompson; sound: Eugene Grossman and Roger Heman; art directors: Richard Day and Mark-Lee Kirk; music: Alfred Newman; costume designer: Royer. Sue ); Eddie Quillan ( Adam Clay ); Spencer Charters ( Judge Herbert A. Bell ); Ward Bond ( Palmer Cass ); Milburn Stone ( Stephen A. Douglas ); Cliff Clark ( Sheriff Billings ); Steven Randall ( Juror ); Charles Tanner ( Ninian Edwards ); Francis Ford ( Frank Ford ); Fred Kohler Jr. ( Scrub White ); Kay Linaker ( Mrs. Edwards ); Russell Simpson ( Woolridge ); Clarence Hummel Wilson ( Dr. Mason ); Edwin Maxwell ( John T. Stuart ); Robert Homans ( Mr. Clay ); Charles Halton ( Hawthorne ); Jack Kelly ( Matt Clay, as a boy ); Dickie Jones ( Adam Clay, as a boy ); Harry Tyler ( Barber ). Wooten, W. P., An Index to the Films of John Ford , London, 1948. Mitry, Jean, John Ford , Paris, 1954. Haudiquet, Philippe, John Ford , Paris, 1966. Bogdanovich, Peter, John Ford , Berkeley, 1968; revised edition, 1978. Springer, John, The Fondas: The Films and Careers of Henry, Jane, and Peter Fonda , New York, 1970. Baxter, John, The Cinema of John Ford , New York, 1971. McBride, Joseph, and Michael Wilmington, John Ford , London, 1975. Sarris, Andrew, The John Ford Movie Mystery , London, 1976. Ford, Dan, Pappy: The Life of John Ford , Englewood Cliffs, New Jersey, 1979. Sinclair, Andrew, John Ford , New York, 1979. Fonda, Henry, and Howard Teichmann, Fonda: My Life , New York, 1981. Anderson, Lindsay, About John Ford , London, 1981. Caughie, John, editor, Theories of Authorship: A Reader , London, 1981. Schatz, Thomas, Hollywood Genres: Formulas, Filmmaking, and the Studio System , New York, 1981. Eisenstein, Sergei, Film Essay and a Lecture , edited by Jay Leyda, Princeton, 1982. Goldstein, Norm, Henry Fonda: His Life and Work , London, 1982. Thomas, Tony, The Films of Henry Fonda , Secaucus, New Jersey, 1983. Cole, Gerald, and Wes Farrell, The Fondas , London, 1984. Roberts, Allen, and Max Goldstein, Henry Fonda: A Biography , Jefferson, North Carolina, 1984. Reed, Joseph W., Three American Originals: John Ford, William Faulkner, Charles Ives , Middletown, Connecticut, 1984. Norman, Barry, The Film Greats , London, 1985. Gallagher, Tag, John Ford: The Man and His Films , Berkeley, 1986. Stowell, Peter, John Ford , Boston, 1986. Buscombe, Ed, editor, BFI Companion to the Western , London, 1988. Lourdeaux, Lee, Italian and Irish Filmmakers in America: Ford, Capra, Coppola and Scorsese , Springfield, 1990; 1993. Sweeney, Kevin, Henry Fonda: A Bio-Bibliography , New York, 1992. Davis, Ronald L., John Ford: Hollywood's Old Master , Norman, 1997. Girus, Sam B., Hollywood Renaissance: The Cinema of Democracy in the Era of Ford, Capra, and Kazan , New York, 1998. Levy, Bill, John Ford: A Bio-Bibliography , Westport, 1998. Eyman, Scott, Print the Legend: The Life and Times of John Ford , New York, 1999. Herzberg, Max J., "A Guide to the Study of the Historical Photoplay Young Mr. Lincoln ," in Photoplay Studies (New York), no. 9, 1939. New York Times , 31 May 1939. Variety (New York), 7 June 1939. New Yorker , 10 June 1939. Greene, Graham, in Spectator (London), 22 September 1939. Johnson, Albert, "The 10th Muse in San Francisco," in Sight and Sound (London), Spring 1955. Hill, Derek, "Press Conference," in Sight and Sound (London), Summer 1957. Smith, Maynard T., "Lamar Trotti," in Films in Review (New York), August-September 1958. Springer, John, "Henry Fonda," in Films in Review (New York), November 1960. McVay, Douglas, "The Five Worlds of John Ford," in Films and Filming (London), June 1962. McBride, Joseph, and Michael Wilmington, in Film Heritage (Dayton, Ohio), Summer 1971. "Ford Special Issue" of Velvet Light Trap (Madison, Wisconsin), August 1971. "Ford's Stock Company Issue" of Filmkritik (Munich), January 1972. Gieure, R., "Une 'Reprise' ciné-club: Young Mr. Lincoln de John Ford," in Cinéma (Paris), March 1972. "John Ford's Young Mr. Lincoln : A Collective Text by the Editors of Cahiers du Cinéma ," in Screen (London), Autumn 1972. Wollen, Peter, "Afterword," in Screen (London), Autumn 1972. Mairal, J. C., "Notes sur deux films Hollywoodiens," in Image et Son (Paris), no. 269, 1973. Mate, Ken, "How Green Was Your Valley Then, John Ford," in Velvet Light Trap (Madison, Wisconsin), vol. 8, 1973. Brewster, Ben, "Notes on the Text: 'John Ford's Young Mr. Lincoln by the Editors of Cahiers du Cinéma,"' in Screen (London), Autumn 1973. Henderson, Brian, "Critique of Cine-Structuralism," in Film Quarterly (Berkeley), Winter 1973–74.
" Young Mr. Lincoln Issue" of Filmkritik (Munich), February 1974. Abel, R., "Paradigmatic Structures in Young Mr. Lincoln ," in Wide Angle (Athens, Ohio), no. 4, 1978. Place, J. A., in Wide Angle (Athens, Ohio), no. 4, 1978. Abramson, R., and R. Thompson, " Young Mr. Lincoln Reconsidered: An Essay on the Theory and Practice of Film Criticism," in Ciné-Tracts (Montreal), Fall 1978.
" Young Mr. Lincoln de John Ford," in Skrien (Amsterdam), Winter 1978–79. Browne, Nick, "The Spectator of American Symbolic Forms: Re-Reading John Ford's Young Mr. Lincoln ," in Film Reader (Evanston, Illinois), no. 4, 1979. Place, Janey, in Magill's Survey of Cinema, 4 , Englewood Cliffs, New Jersey, 1980. Kinder, Marsha, "The Image of Patriarchal Power in Young Mr. Lincoln and Ivan the Terrible Part 1 ," in Film Quarterly (Berkeley), Winter 1985–86. Oms, Marcel, "Lincoln et Guillaume Tell sur l'autel de la patrie," in Cahiers de la Cinémathèque (Perpignan), no. 45, 1986. Goodman, Walter, in The New York Times , vol. 138, H32, 18 September 1988. Andrew, D., "Revolution and the Ordinary: Renoir's La Marseillaise ," in Yale Journal of Critcism , vol. 4, no. 1, 1990. Carty, Brad, in Wilson Library Bulletin , vol. 64, no. 9, May 1990. Darby, W., "Musical Links to Young Mr. Lincoln , My Darling Clementine , and The Man Who Shot Liberty Valence ," in Cinema Journal (Austin), vol. 31, no. 1, Fall 1991. Rother, R., "Sentiment und Kalkuel—John Ford," in Filmwaerts (Hannover), Summer 1991. 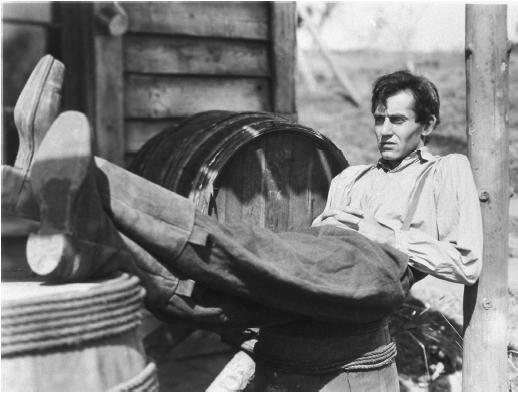 Young Mr. Lincoln was one of three John Ford films, all among his finest, to be released in 1939. Each was noteworthy for a number of reasons, and each introduced to the director's work a particular aspect that would become identified with the thematic concerns of the rest of his career. Stagecoach , for example, was his first film with John Wayne and his first use of Arizona's spectacular Monument Valley as a locale. Both would become Ford institutions in succeeding years. Drums Along the Mohawk , the earliest of his histories, in terms of its internal chronology, also marked the beginning of an examination of the American past that would occupy much of the rest of his life. Young Mr. Lincoln was Ford's first film with Henry Fonda, another actor with a very definite function within the director's films. Through careful crafting of Fonda's character and the script, Ford created for the actor a persona that embodied the traditional qualities of American idealism and a liberal attitude toward the development of the absolutes of civilization. Though this persona was continued in other Ford-Fonda collaborations until 1948 when the actor returned to the New York stage, it was initially employed to elevate the story of Lincoln's early years to the level of a national myth, a myth consistent with the director's own philosophy. In Drums Across the Mohawk , the Fonda persona's aspirations toward civilization are inherent in his yearning for land and a home. When he loses his home, much of his personal stability and self-reliance vanishes with it, and the structure of his family life hovers near fragmentation. In Young Mr. Lincoln , however, the idea of civilization is represented by the broadest concept of the law—one that is indicated by Lincoln's statement in the trial scene. His profession that "I may not know much about the law, but I know what is right!" has less to do with a court of justice than it does with Ford's idea of a higher law. The future president is presented by the film as a proponent of God's law, which Ford relates through a number of scenes, as being intertwined with concepts of family, the future and nature itself. One scene, in which Lincoln is sitting by a river studying Blackstone's Commentaries and is interrupted by Ann Rutledge who wants to talk about the future, ties all of these ideas together as does his monologue at her grave when he invokes her memory (as well as that of his deceased mother) to aid in his decision to become a lawyer. The entire trial sequence, in fact, casts Lincoln in the role of a defender of the American family, attempting to keep it intact. The use of the poem, "Nancy Hanks," at the beginning of the film establishes for the viewer a consciousness of the historical Lincoln while, at the same time, serving notice that the function of art is not simply a retelling of history but a rewriting as well. Therefore, the story that follows utilizes the audience's already mythical assumptions concerning the historical personage as one element in Ford's creation of the new myth. The character is removed from its historical context, its useful qualities extracted and merged with those of the carefully constructed Fonda persona to be employed for Ford's own purposes. So striking was the merger of the Fonda and Lincoln qualities that, for many years, the film was heralded solely for the youthful exuberance of Fonda's performance. Now, however, the film is appreciated for its classic craftsmanship and as an exposition of the mythmaking process in America.